Your email address and personal details will remain strictly confidential and will never be sold or loaned to any third party. You may unsubscribe quickly and simply at any time using the link provided with each and every weekly horoscope. * The results are not guaranteed as the data varies depending on the natal chart of each person. 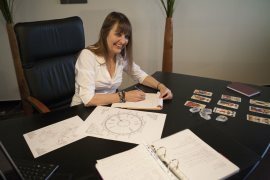 As soon as I have received your request I will straight away start working on the analysis of your Personal Configuration and its different aspects in astrology. In about 2 hours you will receive to the email you have indicated on this page your entirely Personal Horoscope which will include the analysis of the past circumstances, present situation and future opportunities.